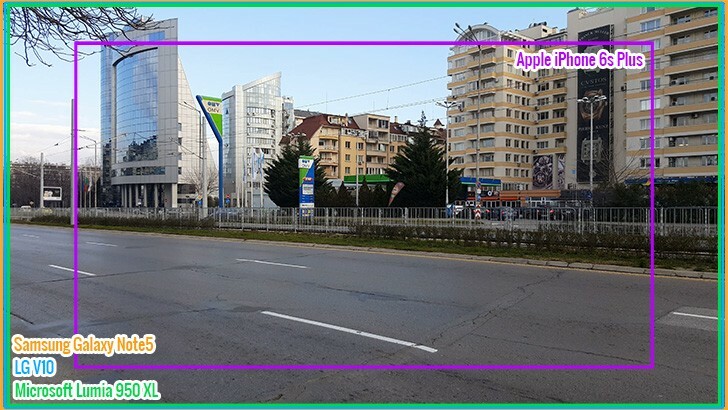 This is the first time Apple has done 2160p video, matching the competition. The Lumia lineup has done 2160p for a while now, but the 950 XL is the first to do it out of the box (previous models had to wait for an update). The field of view of the Microsoft Lumia 950 XL, LG V10 and Samsung Galaxy Note5 is essentially the same. The Apple iPhone 6s Plus is noticeably narrower. That's because it has to leave room for the electronic image stabilization to do its thing. The others offer electronic image stabilization only in 1080p video recording. The Lumia 950 XL's dynamic range (or overeager contrast setting) betrays it again, and it lost detail in the bright sky (as the other three did), but also in the shadows in the trees. Color rendering is exaggerated again and the white balance shows a noticeable yellow tint. Traces of color noise can also be found. Strong sharpening doesn't quite bring fine detail back to life. 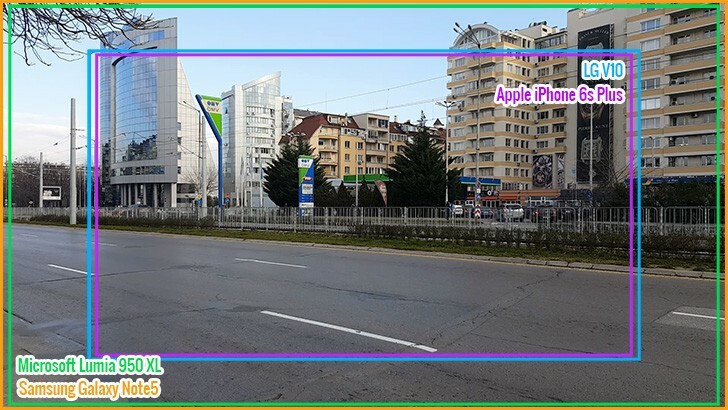 The narrower FoV of the iPhone 6s Plus gives it a small push and without heavy-handed processing, it manages to preserve more detail than the Lumia. Colors aren't where they need to be, but are still closer to reality. The LG V10 videos stand noticeably sharper and the colors are much more believable. Color-wise, the Note5 is more accurate, but the V10 does its job of a reference camera very well - it sets the bar high. The Samsung Galaxy Note5 eliminates some noise that the LG left in, but that puts it behind on detail. It also uses heavy sharpening, which emphasizes the detail captured by the camera. It still threw away plenty, especially in areas of complex detail. The iPhone 6s Plus continues the tradition of recording mono sound at a fairly low quality for an underwhelming experience. The Microsoft Lumia 950 XL is on the other end of the spectrum with 256Kbps/48kHz stereo sound. To our ears, the LG V10 (156Kbps/48kHz) performs best of the lot, because it masks out noise better. Don't forget its option to adjust the microphones to be more sensitive to sound coming from the scene (ahead of the phone) or from you (behind the phone). Winner: Samsung Galaxy Note5. Aside from the reference camera (V10), the Note5 videos were the sharpest and with accurate colors. Sound is very good. Runner-up: Apple iPhone 6s Plus. Apple really needs to do something about the audio, it's not fit for a flagship. Other than that, videos have slightly more detail than the Lumia's, more accurate colors, too. Third place: Nokia Lumia 950 XL. It gets a high mark on audio, but the camera doesn't make full use of the 4K video potential. The field of view may change significantly when you switch the resolution to 1080p. The Lumia 950 XL and Galaxy Note5 cameras stay as wide as before, but the iPhone 6s Plus field of view shrinks a bit. The most dramatic change comes from the LG V10 field of view, which turns almost as narrow as the iPhone's. 1080p has been an iPhone mainstay for years and the quality with the new camera is very high. The narrower FoV sure helps, but it resolves detail than the Lumia videos. The Samsung Galaxy Note5 camera is as wide as the Lumia, but its videos appear sharper, noticeable in foliage and a few other places. The Lumia 950 XL still underexposes shadows, but the issue is less pronounced than with 2160p videos. The LG V10 offers excellent quality and the narrower FoV helped it capture a lot of detail (more than the iPhone) at the cost of fitting less of the scene. Winner: Samsung Galaxy Note5. A wide camera with plenty of detail and accurate colors. Runner-up: Apple iPhone 6s Plus. Its big downside is the narrow view, but the quality is very good. The issue of mono audio persists though. Third place: Microsoft Lumia 950 XL. It was close and we do appreciate the wide lens, but the Lumia captured less detail in its videos (much better audio though).